The blue, glimmering Pacific Ocean. On his 1997 trip from Hawaii back to the US mainland, Captain Charles Moore expected captivating views of its pristine waters. After all, he’d be sailing across one of the most remote regions of the ocean, one of Earth’s few oases untouched by industrialization. But the waters weren’t pristine. Instead, the captain and his crew were “confronted, as far as the eye could see,” with the sight of floating trash. The gargantuan whirlpool he sailed through is known as the North Pacific Ocean Gyre. He was the first to discover that the gyre was, and still is, trapping an immense amount of debris. That debris is almost entirely plastic. The gyre, one of five in the world’s oceans (Figure 1), is now commonly termed the Great Pacific Garbage Patch. It’s a reasonable characterization considering that around 87,000 tons of plastic are currently floating in it. This plastic, though, is distributed over an area roughly the size of Texas, and much of it is in extremely tiny bits called microplastic. In that sense, the garbage patch is really more like a garbage soup. Though soupy, the unsightly collection of plastic can be a deadly trap for the marine creatures who encounter it. 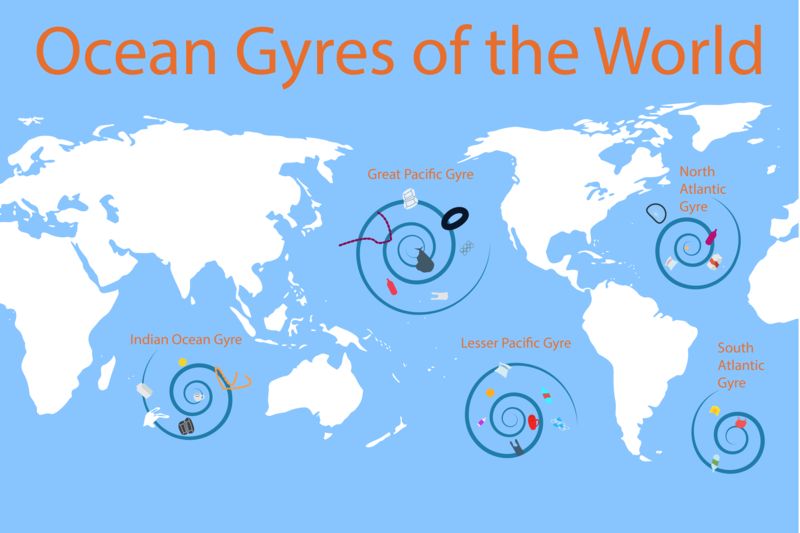 Figure 1: The five ocean gyres on Earth all have floating plastic in a variety of sizes swirling in them. The Great Pacific Gyre is the most infamous. Why does plastic predominate in these remote ocean gyres? It’s certainly not the only thing we’re throwing out. Of the 260 million tons of solid waste that US consumers tossed in 2015, only 13% was plastic. In an unpleasant plot twist, the properties that make plastic so alluring are the same ones that make it the most persistent waste we produce. Plastic is light, water resistant, insulating to heat & electricity, and remarkably durable. It’s also very cheap to make. The starting ingredient is raw organic material from petroleum, natural gas, or less typically dead plant matter – an ever more appealing option as the ire towards fossil fuels grows. This organic stuff is refined, purified, and ultimately converted into simple, carbon-based chemicals such as propylene or ethylene. These chemicals can be linked together to create the long carbon chains we call plastic. When plastic first started being manufactured on a commercial scale in the 1950s, people viewed its alluring properties as revolutionary. They had a point. For example, when is the last time you saw a phone, computer, or any electrical wiring without an inexpensive, electrically resistant plastic casing? We have plastic to thank for the widespread availability of commercial electronics, including the one you’re likely using to read this right now. However, the initial focus was on creation, with little thought of how difficult disposal might be. This difficulty is due to its durability. Plastic’s durable nature is remarkable because although it’s made from organic matter, living things cannot digest it and break it down – a stark contrast to food and paper waste. Plastic’s intractably long chains of carbon make it impossible for even bacteria to break down, the process by which most waste degrades in our landfills. Consequently, plastic can stay around for hundreds of years (unless we recycle or incinerate it, neither of which we do much of). Over a third of plastic is made for single use, most of it being discarded within a year of manufacture. Where does this discarded plastic go? All over the place, being found in natural habitats from the poles to the equator. In particular, around 8 million tons of it enter the oceans each year. Figure 2. 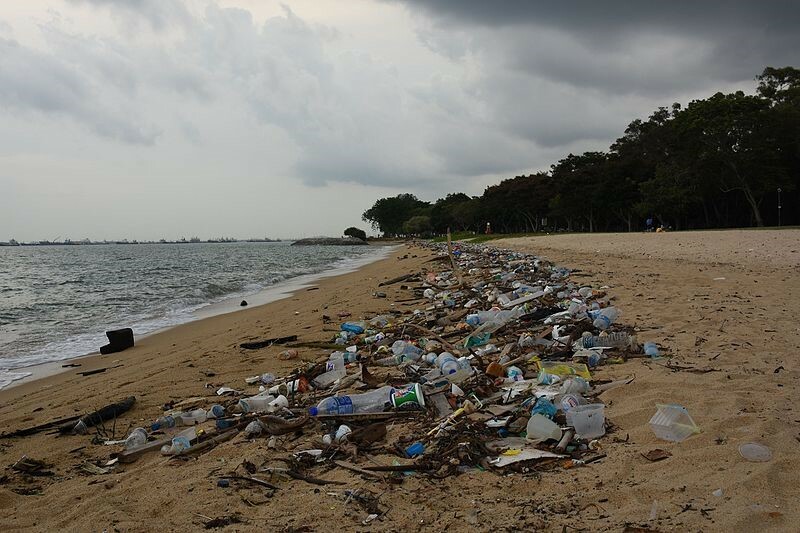 Singapore’s East Coast littered with washed-up plastic debris [photo credit: vaidehi shah via CC BY 2.0]. Plastic’s low density allows it to float on water and be swept away by winds and waves across the seas. While most of the plastic lost to the ocean eventually returns to us by littering our shores (Figure 2), much of it is carried all over the oceans where it accumulates in massive gyres. Plastic’s durability does have a limit. The sun’s ultraviolet light and harsh ocean waves can break down the carbon chains somewhat effectively. This doesn’t improve the situation, though; the plastic merely fragments into smaller bits, often less than a few millimeters in diameter. Sea turtles and other lovable marine creatures get tangled up in netlike plastic debris, but the microplastics can present serious issues, too. For instance, what would eat a tiny piece of plastic about the size of plankton? Anything that eats plankton. This includes animals of all sizes, from whales to scallops. The plastic fragments get small enough that even plankton can manage to have a taste. The microplastics get trapped in the gills and digestive tracts of hundreds of animal species and can cause all sorts of serious impairments, many of which may lead to death. There’s an additional concern that hits closer to home. Scientists examined fish and shellfish from various markets in California and Makassar, Indonesia. Most of them had plastic or textile fibers in their bodies. Another research team looked to see if microplastics were hidden within one of society’s most widely used ingredients: commercial salt (which is often produced by evaporating sea water). They were. This means we’re likely consuming some of these microplastics, too. It’s unclear whether this would cause any serious issues. Still, the fact that we may be eating some of the floating ocean plastic pulls it away from being a strictly environmental issue to one potentially of public health. Ecosystem damage and public health concerns serve as hearty motivation for The Ocean Cleanup Project, a project funded to undertake the largest ocean clean up in history. Their method of cleaning up the Great Pacific Garbage Patch is to deploy 2000-foot-long floating rods that will corral floating plastic so it can be periodically collected by ships. They will miss the microplastic, but that’s not their goal. They aim to round up larger pieces of plastic before sunlight and waves break them into thousands of microplastic bits. This is the most ambitious ocean clean up ever undertaken. But will it work? The project asserts that an entire fleet entailing around 60 of these devices is necessary to clean up half of the Garbage Patch in 5 years. As of now, they have deployed one. Separately, scientists have expressed concern about how the project might affect marine life such as plankton who could get swept up along with the floating debris. However, the impact on plankton, along with many of the other sea creatures, “should remain local and negligible in comparison to vastness of the North Pacific Ocean” according to Erika Träskvik, an Ocean Cleanup representative who cited the project’s recently released environmental impact assessment as evidence. The most common response to the project, however, highlights the central issue with plastic pollution in general: Ocean Cleanup’s fleet is nowhere near sufficient considering how much plastic we’re producing—and discarding—every year. Ideally, we’d take action to keep plastic waste from getting into the ocean in the first place. Both governments and businesses seem to agree. This summer, Starbucks and McDonald’s both announced plans to phase out single-use plastic straws, but this is a tepid example. The European Union has plans to ban all single-use plastics by 2021, and 250 major brands such as Nestle and Coca-Cola announced they’ll do the same by 2025. Even in the Massachusetts city of Somerville where I live, I stopped being offered plastic bags at my local convenience stores because of a plastic bag ordinance issued by the city. People around the world are gathering their torches and pitchforks to protest single-use plastic. Considering the condition of our oceans alone, this feels justified. But let’s not forget that plastic can be used to the environment’s benefit, too. Cars and planes partly made of plastic are much lighter, significantly reducing the amount of fossil fuels required to run them. Many solar panels have protective plastic layers, and wind turbines’ blades are often made of lightweight, reinforced plastic. We don’t need to limit ourselves to environmental benefits either. Plastic has revolutionized almost every aspect of society. Still, as I type these words in a coffee shop, a single-use plastic bottle is sitting to the right of my computer. And perhaps, you’re drinking from a plastic cup now. Will the plastic in our hands eventually haunt our oceans? What will we do to prevent that? Jordan Wilkerson is a graduate student in the Department of Chemistry & Chemical Biology at Harvard University. Rebecca Senft is a fourth-year Program in Neuroscience Ph.D. student at Harvard University who studies the circuitry and function of serotonin neurons in the mouse.